Why Can’t We Call Mel Gibson ‘Bipolar’? 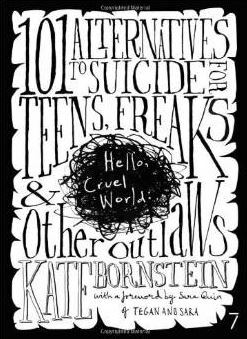 … is the subtitle of my so-far favorite book on suicide prevention. The new #changementalhealth Campaign to Change Direction is starting off with a graphic bang and big commitments by big organizations to make the “five signs” of diagnosible mental health conditions known to everyone. Three of the five — withdrawal, failure to care for oneself, and a sense of hopelessness — are depression symptoms that can also match suicide precursors. Adding a sense of agitation to the mix makes suicide attempts more likely. Suicide prevention is properly a major public health concern today, with more people in the U.S. dying from suicide than from auto accidents, HIV/AIDS, or homicides. Having such a huge public awareness campaign may help to reduce our staggeringly high rate of suicide death (39,000 annually) and attempts (about 130,000). Illness or Lack of Community? Here’s the difference between the mainstream and how these two researchers approach the subject. Mainstream theories – 90-95% of people who suicide suffer from 1 of these 4 mental illnesses: depression, substance abuse, bipolar disorder, or schizophrenia. We face a mental health crisis today in a suicide rate that is among the 10 top causes of death nationwide — as high as top 3 for some age groups. Suicide kills more people than auto accidents, HIV/AIDS, or homicide. Suicide is killing bullied children, military veterans, and our older men deprived of meaningful work.